As the House Transportation Committee got underway with its second day of public testimony on the Alaska Marine Highway System on Thursday afternoon, minority Republicans said they were over it and wanted to move onto other issues. Gov. Michael J. Dunleavy’s budget doesn’t contain funding to keep the ferry operating past Oct. 1, leaving dozens of coastal communities—including Juneau—without regular or affordable access to groceries, transportation or the rest of Alaska. The transportation committee has been inundated with public testimony in support of the ferry system with Tuesday’s hearing hitting record-high participation because, you know, eliminating communities’ access to the rest of Alaska is probably a little alarming. But for the minority Republicans, they’ve heard enough. She said issues like Anchorage’s Ted Stevens International Airport, Anchorage’s Port of Alaska and the area’s roads, highways and railways are being left to languish because the committee held a second public hearing on the ferry system. She made the comments in a prepared statement that was issued 20 minutes into the Thursday hearing. What does ‘modern infrastructure’ look like? It should be noted that the controversial Juneau Access Project won’t, as currently proposed, actually connect Juneau to the road system. 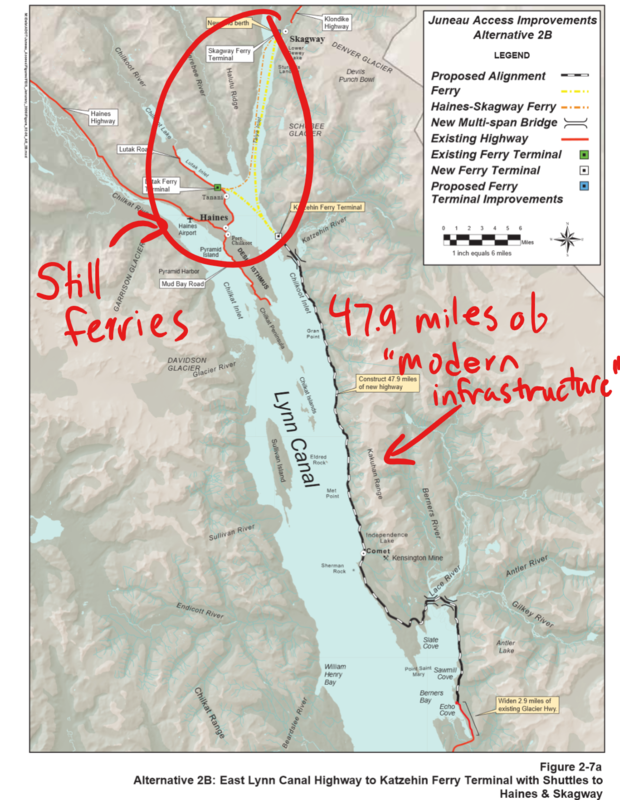 Instead, the most road-intensive proposal would extend the road about 47.9 miles north through some difficult terrain and connect it to, surprise, a ferry terminal for a shorter ferry ride to connect Juneau to Haines and Skagway (though it would just so happen to provide easier road access to a mine along the route). Former Gov. Bill Walker put the brakes on the program, arguing that “a road extended to a yet-to-be-built ferry terminal through more than 40 avalanche zones, with a history of litigation” wasn’t practical given the state’s financial woes. The Juneau Access Project would only shorten Juneau’s ferry ride, not replace the system altogether. It also wouldn’t address the needs of the 30-some other coastal communities that rely on ferries. Though the ferry’s ridership fees don’t cover its operating costs, a 2016 study argued that the state investment in the program didn’t go to waste. The report has since been stricken from both the governor’s website and the Department of Transportation’s website, but it argued that for every $1 invested by the state the economy saw a little more than $2 in return. Office of Management and Budget Director Donna Arduin panned the marine highway system at the release of the budget, arguing that its rate to transport a vehicle was not competitive when compared to land-based highways. “The cost of transporting a vehicle on state highway is about two cents per mile, where it’s about $4.58 per mile on a ferry,” she said. And while the administration has not appeared particularly interested in the financial impacts of programs beyond the income they bring in, they have applied such an argument for the increased dividends. For those who are interested in the economic impacts of the Alaska Marine Highway System, the Internet Archive’s Wayback Machine has a copy of the report. 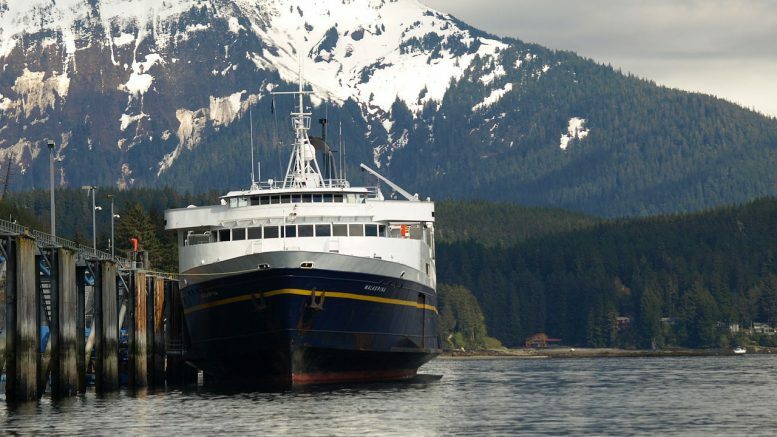 The report found that nonresident ferry passengers spent on average $1,300 in Alaska and those that used it as either an entrance or exit during a visit to Alaska spent an average of $1,700. That’s compared to $941 in average spending of the average Alaska summer visitor. “For every dollar of general fund money not budgeted to AMHS, there will be $2.30 less economic activity in Alaska,” explained the report. The report noted that many coastal communities that have high employment with the marine highway, like Ketchikan and Haines, would be particularly hard hit by cuts to the ferries, as would fishermen who rely on the ferries to ship seafood. There would also likely be less school-related travel, a decline in quality of health because people would have to rely on costlier plane flights for medical access and even fewer cultural events. The report highlighted that Anchorage residents were the second largest group of people using the marine highway system after Juneau. Anchorage was also the top destination for non-resident passengers. 5 Comments on "Republicans complain about focus on ferries, suggesting ‘modern infrastructure’ like roads as easy replacement"
It’d be much cheaper and easier to ‘privatize’ the Glenn from the intersection with the Parks than too sell off the Marine Highway infrastructure. The Alaska Highway from the border to Fairbanks already has the infrastructure for toll collection Just sell it to some untraceable holding company that might be able to profit from it and kick something back to the Alaska Republicans. Easy Peasy. Sarah, with all due respect, the financial debate over the Ferry System is at the top of the list as it is a most important artery within the soul of Alaska. Being a Ketchikan product, the Ferry System touches the heart and wallet of many Alaskan families. SAVE THE FERRY SYSTEM, CUT BACK THE SERVICE NOT THE HEART OF ALASKA. The shortsighted dismissal of Southeast Alaska’s infrastructure needs (ie. ferry system) showcases the ignorant priorities of many legislators living in road-connected Alaska. One expensive seasonal road from Juneau to a short ferry to Haines DOES NOTHING for the rest of the island communities in Southeast Alaska. If we saw any signs you are listening to resident concerns maybe you wouldn’t be hearing such complaints! Wake up! The ferry system is a MARINE ROAD and you are causally cancelling it like it is a nonissue! Still shocked that Ms. Rasmussen has the nerve to talk about lack of street lights on an Anchorage street upgrade. Street lights? Are you kidding? When Southeast can go without transportation. Guess I don’t understand that unapologetic, entitled attitude.